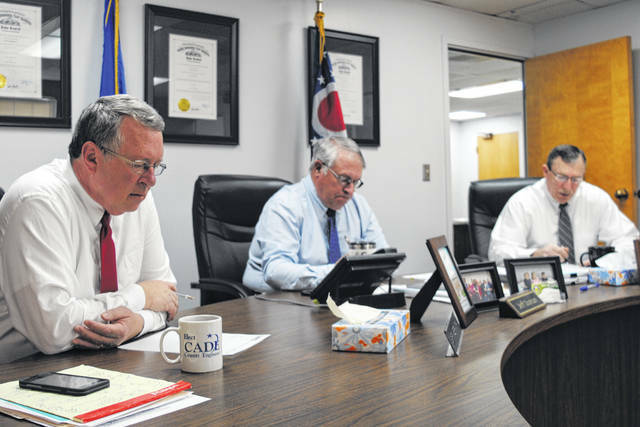 From left, Highland County commissioners Gary Abernathy, Jeff Duncan and Terry Britton meet Wednesday at the Highland County Administration Building. Highland County commissioners on Wednesday signed a letter of appreciation to State Rep. Shane Wilkin for co-sponsoring a House budget amendment that provides full reimbursement to counties for legal representation of indigent citizens. Commissioner Terry Britton said at the board’s weekly meeting that much of the financial burden for indigent defense has rested on Highland County rather than the state, with the county footing about 60 percent of the bill and the state 40 percent. The situation will continue to deteriorate in 2021, the letter says, due to a change in federal tax law that keeps sales taxes from being applied to business internet access. • Commissioners tabled discussion of a new surety bond for public employees. • Britton said sewer improvements in the Rocky Fork Lake area are being engineered and the project will hopefully be funded by the Ohio Valley Regional Development Commission. • Duncan said he attended a legislative gathering at the Ohio Statehouse Tuesday night. • Abernathy said Dash for DD, a “worthy event” for the Highland County Board of DD, will be held Saturday. • Commissioners also approved a transfer of $22,000 to capital improvement for the Highland County Airport, and signed off on other routine financial resolutions and contracts. https://www.timesgazette.com/wp-content/uploads/sites/33/2019/04/web1_f-commish-041019.jpgFrom left, Highland County commissioners Gary Abernathy, Jeff Duncan and Terry Britton meet Wednesday at the Highland County Administration Building.